Whether you’re an athlete or a rowing coach, your challenge is to make the boat go fast. Efficient rowing technique is key, but how do you know when your technique is actually “efficient”? How do you select the right boats and oars? Should you change the rigging? To find solid answers to these questions, you need to measure your performance on the water. Rowing in Motion is a measurement system that requires you to only attach a smartphone to the boat to help you with that. Not with Rowing in Motion! Before we developed RiM, coaches had two choices for measuring performance in rowing. Either you were content with a stroke-meter that measures stroke-rate and splits or you hired one of the scientists that works with the elite teams using complicated and expensive equipment . And then figured out how to make sense of all the data that comes out of it once you’re off the water. We asked ourselves: Couldn’t we use measurement systems much more often if they were made to be used by club coaches and ambitious master rowers? If they were easy to install? And what about getting feedback from the measurement data while you’re still on the water and can try new things, not once the boat has been pulled from the dock? 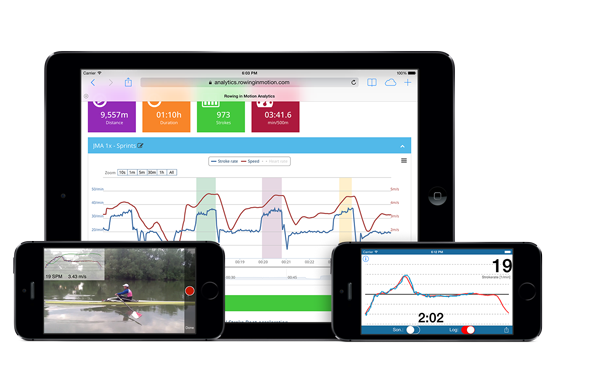 Rowing in Motion is here to make measuring rowing performance easy for athletes and coaches at all levels. It all starts with your smartphone, which is the perfect feedback device for any athlete. Our Apps show you live graphs and numbers about your performance, can produce acoustic feedback via sonification, and logs everything for later analysis. 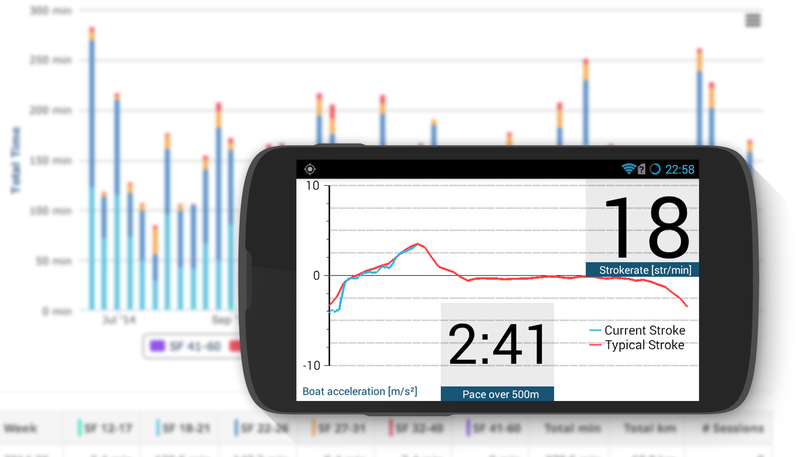 Rowing in Motion scales from a basic system that measures stroke-rate, distance and boat acceleration using only your smartphones’ integrated sensors to a highly accurate system with a purpose built high-precision boat speed sensor and wireless sensor gates that measure force and angle at each gate. 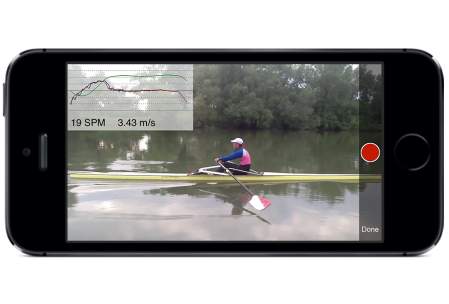 It’s as easy to use as a traditional stroke-rate device but provides a lot more powerful data that you can combine with video analysis and analyse later, to actually help you learn how to row faster. To get even better data you can add our fully wireless sensors that you can install in less than two minutes. No hassle with cables, no laborious calibration procedures. Clip the SensorBox to your boat for precise speed measurements and get rich live feedback with our App for smartphones and tablets using the integrated WiFi base station. And soon you will be able to replace your standard oarlock with our wireless sensor gate to get force, power and angle measurements too. Coches can follow behind and receive the data from a boat in realtime and create an HD video analysis automatically synchronized to the data that helps you to make sense of the data by correlating the crews motion with the measurement data. Give Rowing in Motion a try to see what other amazing things we can do for you.